In my eyes, a power tower with bench is the ultimate strength training equipment for home. You know, I prefer bodyweight training, but also like dumbbell exercises. I believe, versatility is a critical factor for constant muscles development. Also, different types of workouts support progressive overload and not getting bored with training. This type of workout station gives a wide range of possibilities to have a total upper body workout. 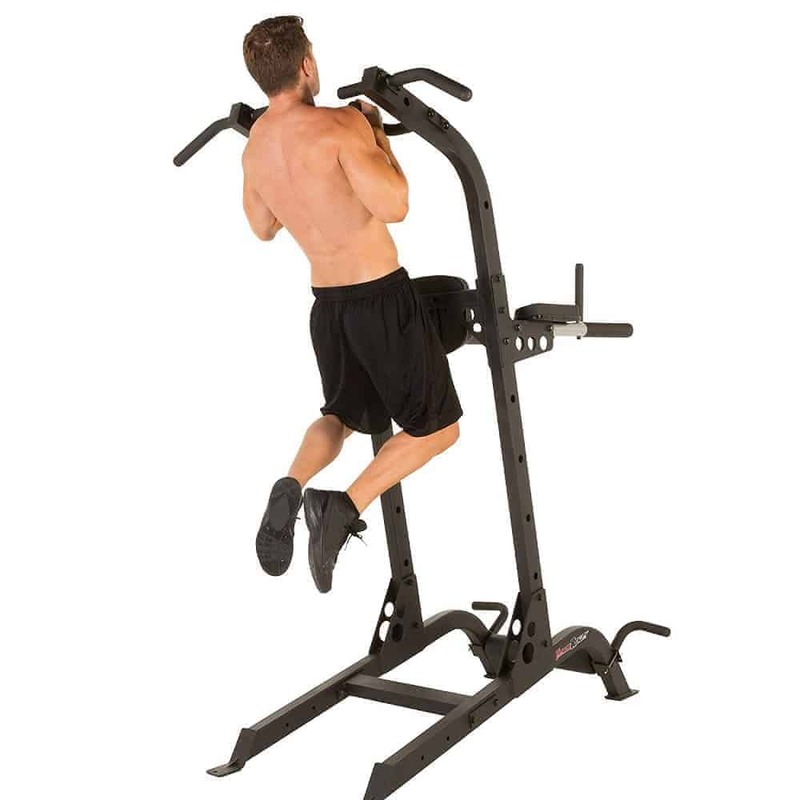 The power tower itself comes with all the functions that are required for the most beneficial bodyweight exercises like chin ups, pull ups, dips, leg raises, push ups, etc. Moreover, with a pair of adjustable dumbbells and weight bench, you have a full body weight training. Do exercises like bench press, flyes for your chest, or shoulder presses. The main benefit of a power tower with an adjustable bench is more compact as if you get the equipment one by one. Hence, it is a good option for people having a small space. Well, there are not many products of this kind, but I looked around, and I found the following items. 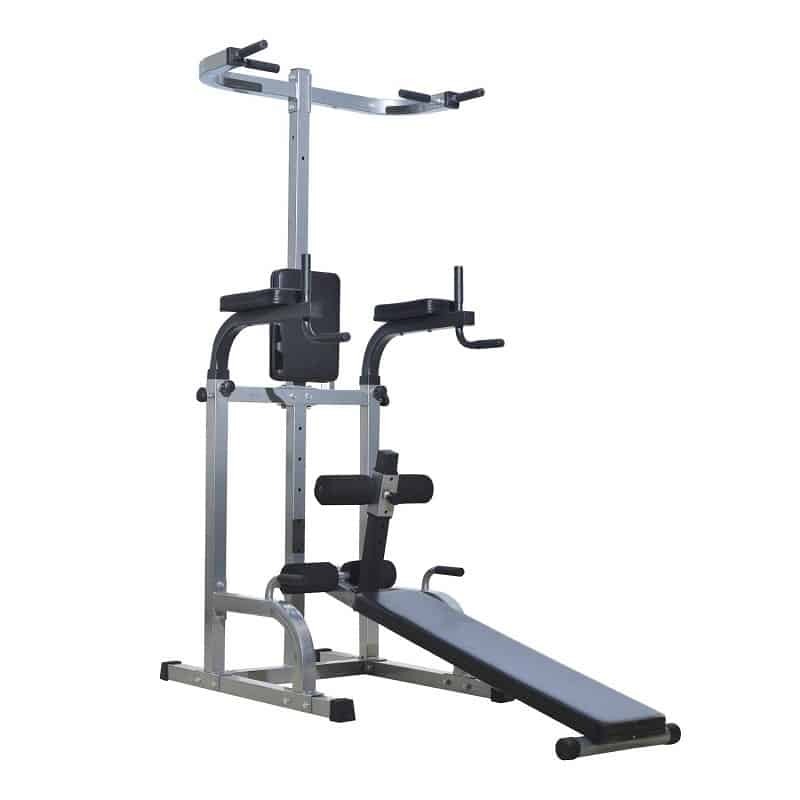 Steelbody STB-98502a very versatile workout machine which is a kind of hybrid equipment. Firstly, you can use it as a squat stand. It comes with easy to set bar catches with more than 15 positions. Hence, you can find optimal heights for exercises like bench press and military press. The maximum capacity of the bar catches is 500 lb. It is compatible with Olympic bars, although the distance between the uprights could be more. Bigger guys may find the space a bit little while pressing. Also, a 7′ Olympic bar may tip over if you put too many weight plates on one side. This is an excellent space-saving function. When you do not need it, you just raise it up. 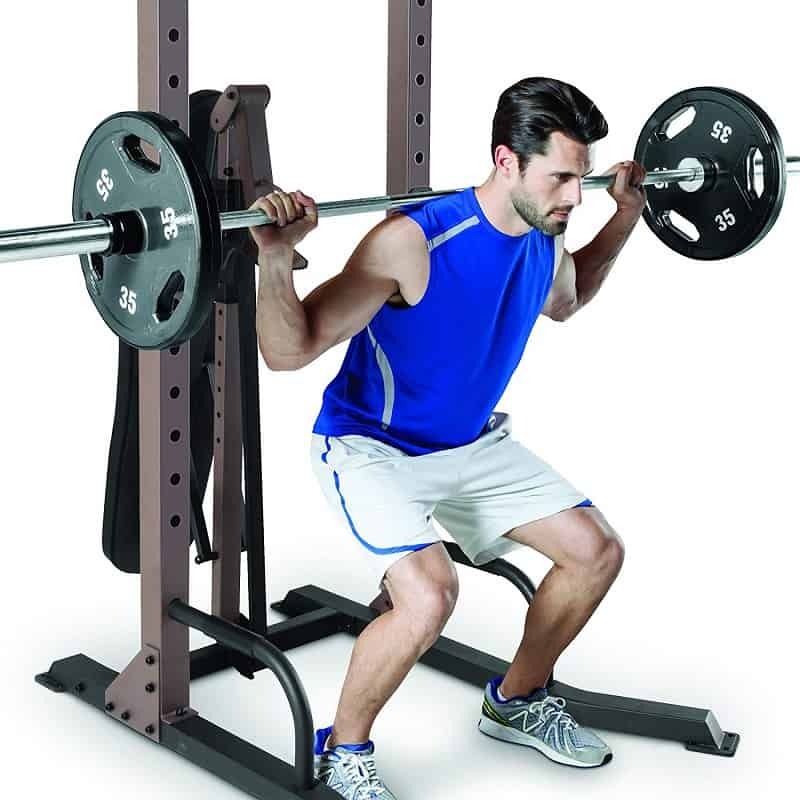 Then, you can use the power tower or squat stand function. Fold-up bench handles make the process easy. The bench has a pretty high capacity which is 800 lb, including the user weight, thanks to the heavy duty construction. The backrest is high-density foam upholstered for comfort. You can set the adjustable weight bench in various decline positions and flat. The slide track adjustment makes the changes easy. This way you can perform even more types of exercises. 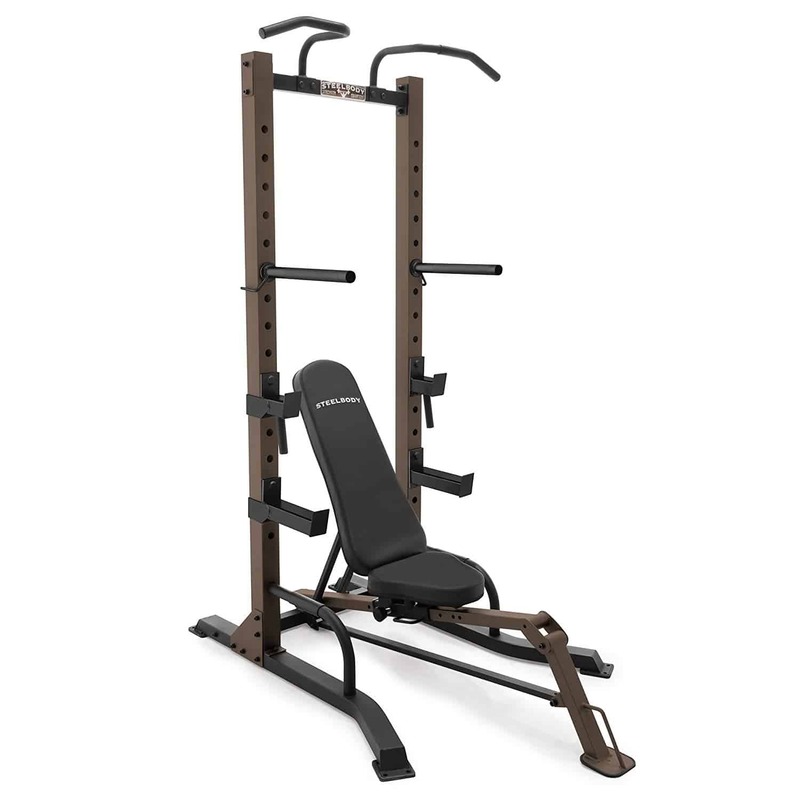 Steelbody comes with a multi-grip pull-up bar for various pull ups and chin ups. The height of the tower is 84 inches which makes it a good choice for taller guys. The capacity is 300 lb which should be enough for most of the people. A good thing that it comes with the removable/adjustable dip station bars. You can fix them in various positions the same way as the bar catches. Therefore, you can find a more comfortable height for you to do assisted or other dip variations. The only negative thing is that it does not have the vertical knee raise station like standard power towers. Although, you can still do hanging leg or knees on the bar. Well, I recommend it! Mainly because we can do a lot of types of strength training exercises. I particularly like the squat stand feature. It substitutes many pieces of home gym equipment. 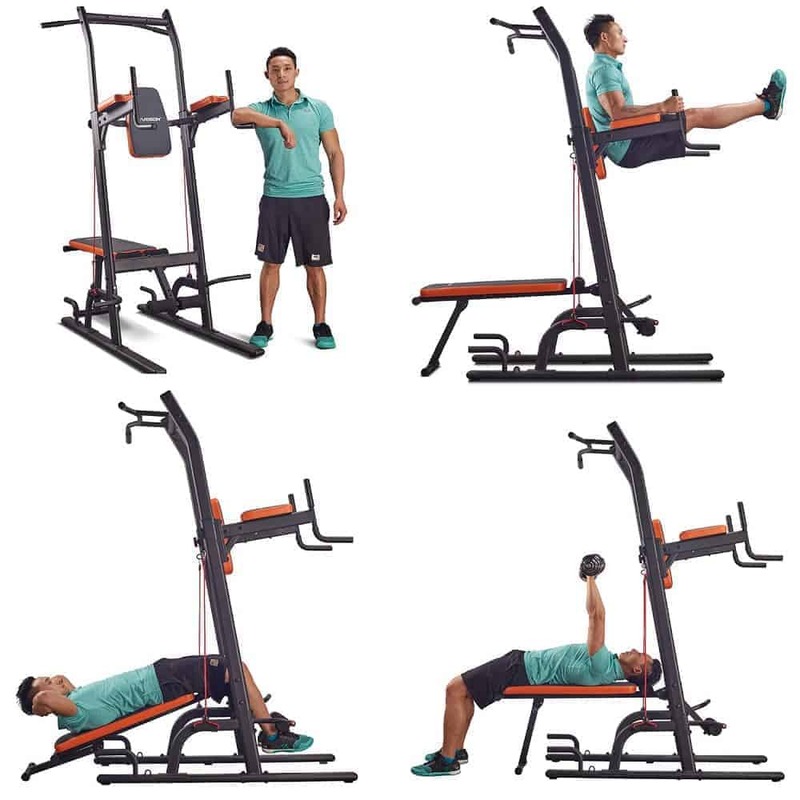 Just like the previous, Harison is also multifunction gym equipment. It has all the known stations of the regular tower, plus a workout bench. Compared to the previous one it has a vertical knee raise station, but the bench is not as professional. Although, its 500 lb weight capacity is fantastic! 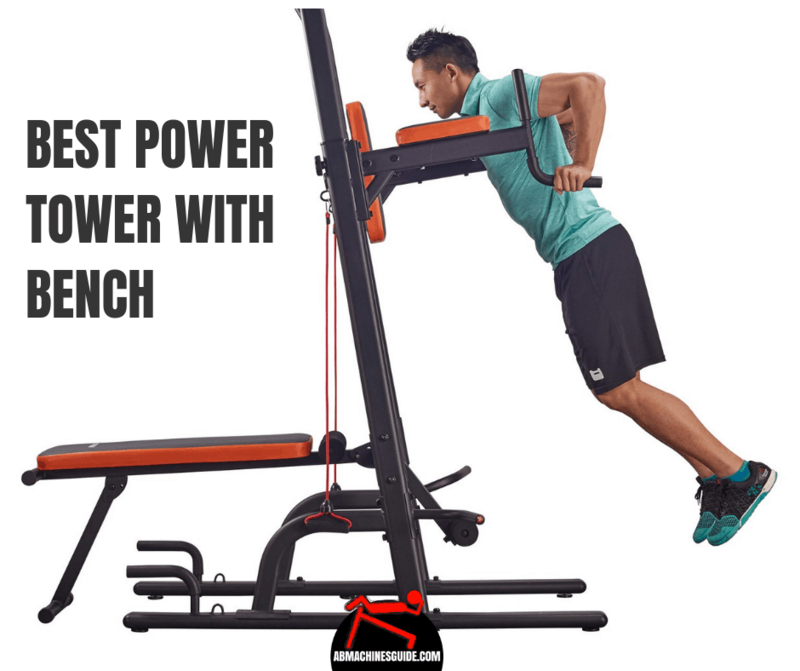 It is an adjustable power tower with bench press which is very rare. You can set the set heights from 70.47 inches, 76.38 inches, 82.28 inches up to 88.19 inches. This way, shorter people can reach the multifunction pull-up bar more comfortable, while taller individuals have more space to exercise. Handy feature. As you see, the frame is not vertical to the ground but angled a little bit. This way, while you do pull ups or chin ups, you get a further from the uprights so that you have more space for training. Moreover, when you do vertical knee raise, your body gets into such a position that helps to do the exercise more correctly. With that, you can target your abdominal muscles better. The back cushion and elbow pads also support to get that position. It is a simple board that is fixed to the frame with a bolt, and it is easy to remove if you do not need it. However, you can fold it up to have space for pull-ups, or to save space. Anyway, it is not adjustable. I mean it can be used for flat bench exercises or as an ab bench. Still very useful for dumbbell training. Well, this is a well-made, compact and versatile power tower with weight bench. Its adjustability is also great. Definitely worth to check out. Soozier has the typical functions: dip, pull up, VKR, push up station. However, it comes with an adjustable sit up bench. Hence, it is an excellent option for people who want to focus on their abs. The tower itself is very stable and heavy-duty supporting maximum 660 lb. Users are satisfied with stations. 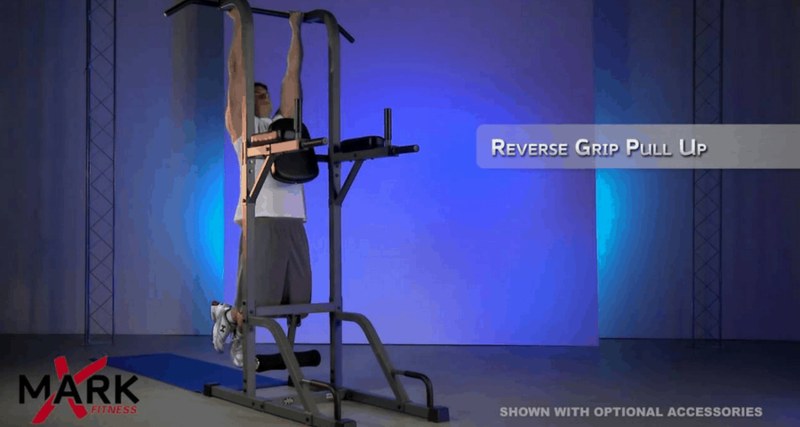 Although, the multi-grip pull-up station is a bit unique. It is not a typical full bar design. The ab bench also has 300 lb capacity so you may use it for lightweight dumbbells exercises. There 7 angles you can choose from. The lowest is acceptable for beginners, while the highest is tough enough for pros. To sum up, it is reliable exercise equipment, that costs less than the previous two. I hope you found the most suitable power tower with bench for you. These are very versatile and space-saving items to work out at home. Bowflex BodyTower Review | Is It Good Workout Tower?